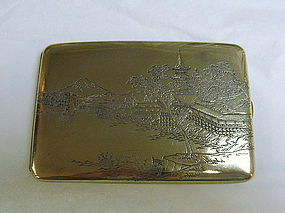 A lovely Japanese sterling silver cigarette case with landscape Mt. Fuji in the background and a horse grazing in the foreground. 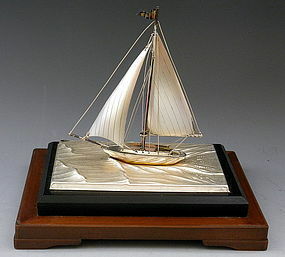 The interior features the same scene as the front, but with copper highlights. The case has a slight curve, a very nice feature, and is in very good condition. Measures 4 3/4" x 3 1/8" in closed position. 4.3 troy oz.